Today we woke up extra early to get ready, pack last minute items and disembark. There are 2 ways you can disembark on Disney Cruise Line. You can meet early in the lobby, tote your own luggage, and leave the ship on your own. That’s Express Walk Off. Or you can go to breakfast at an assigned time and have the ship handle your luggage. Then you’d pick up your luggage in the terminal on your way out. We chose to do the Express Walk Off because we like to hit the road early so we can get home at a reasonable time. Because we have late dinner we would have late breakfast so we wouldn’t even sit down to eat until 8 am. Because of the mechanical troubles, we were still moving when we woke up! We weren’t able to leave the ship, even with express walk off, until 8 am because of being late to the port. Even still, there were NO lines in customs so we breezed right through and were out to our car within 20 minutes of leaving our room! Love how organized Disney is! I forgot to tell you something! When your ship is sailing away, your loved ones at home can watch via the Port Canaveral web cam! 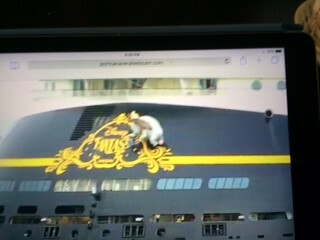 Mom of CSP watched us sail away and took some screen shots of the Fantasy. 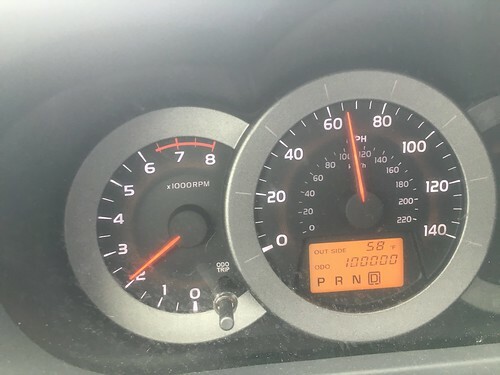 Back to our last day of vacation… the drive home was uneventful except for Blanca (my trusty RAV 4) turned 100,000 miles! 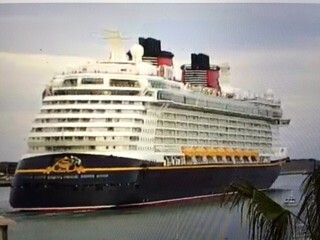 Now the Fantasy was scheduled to leave today for a Western Caribbean cruise at 5 pm. But because of the mechanical troubles she had on our cruise she didn’t leave until 7:15 pm!!! Even with mechanical troubles we still had a magical vacation and we can’t wait for next time!! !